The Royal Tiger was granted to the 67th for its service in India between 1805 to 1826. 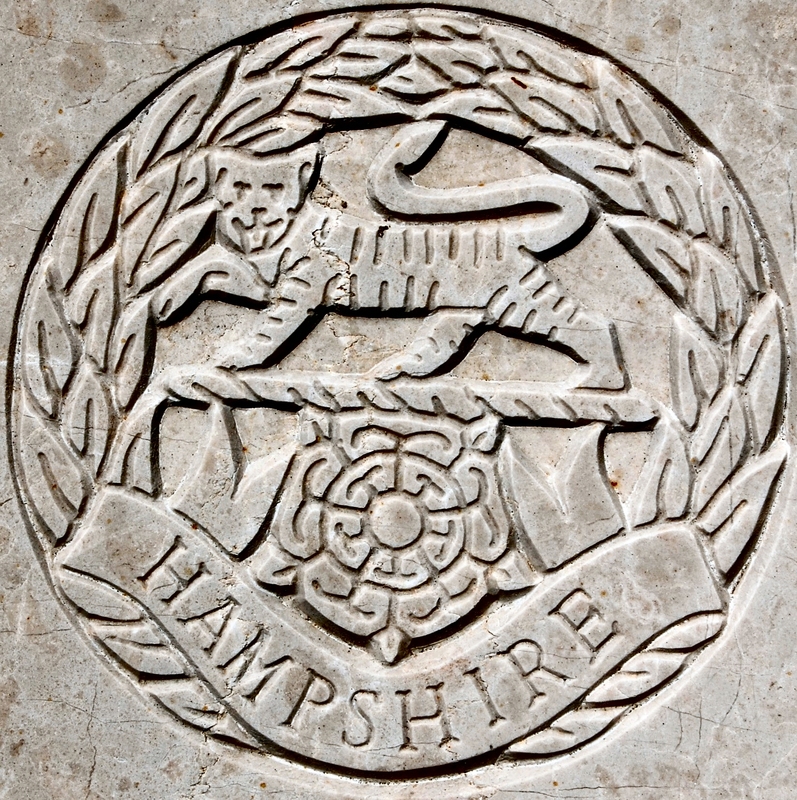 The Hampshire Regiment was formed on 1 July 1881 through the merger of the 37th (North Hampshire) Regiment with the 67th (South Hampshire) Regiment of Foot. 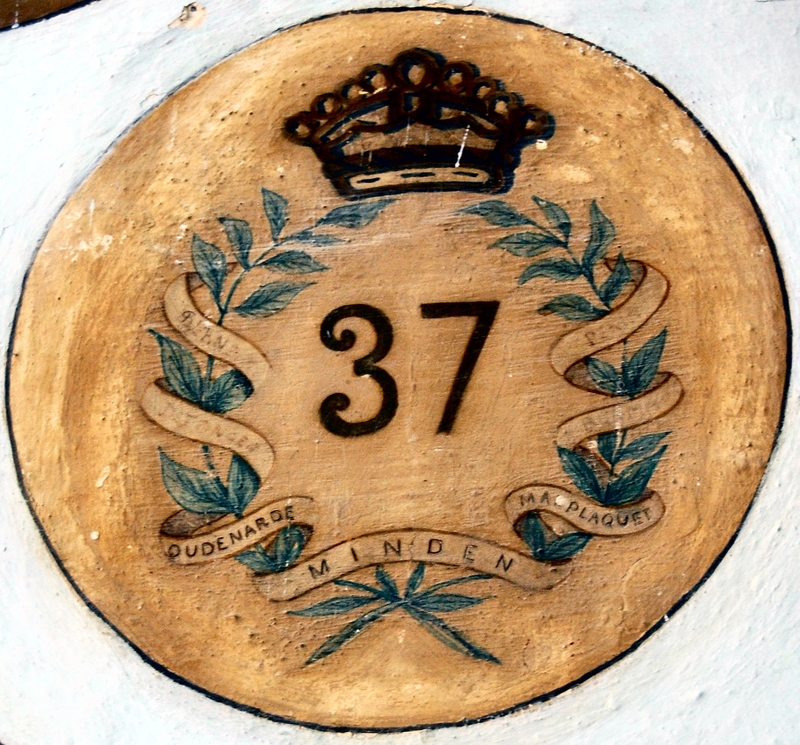 The 37th became the 1st Battalion, The Hampshire Regiment. 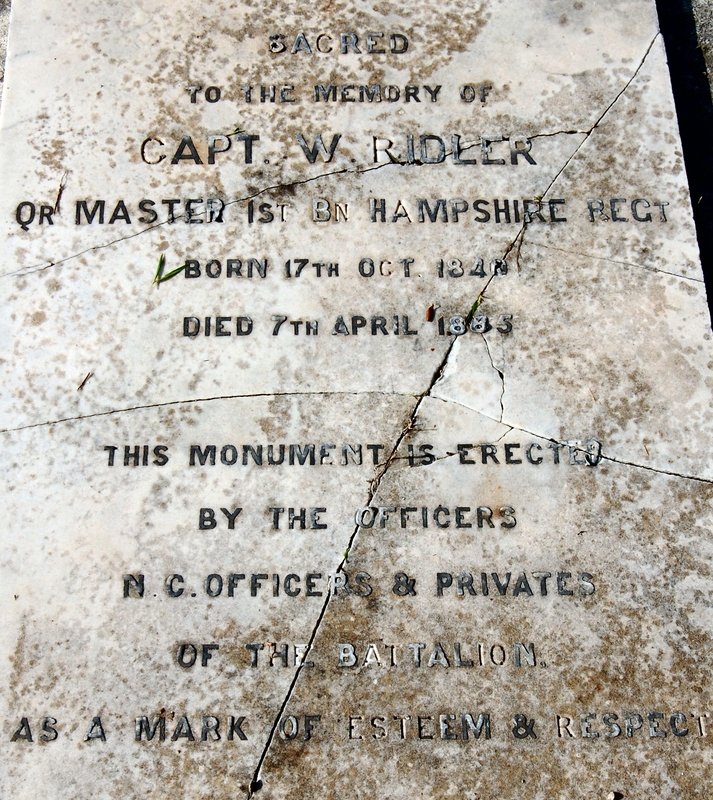 It fought at the Battle of Minden on 1 August 1759 and roses from Minden Heath were grown at its Regimental Depot at Winchester. 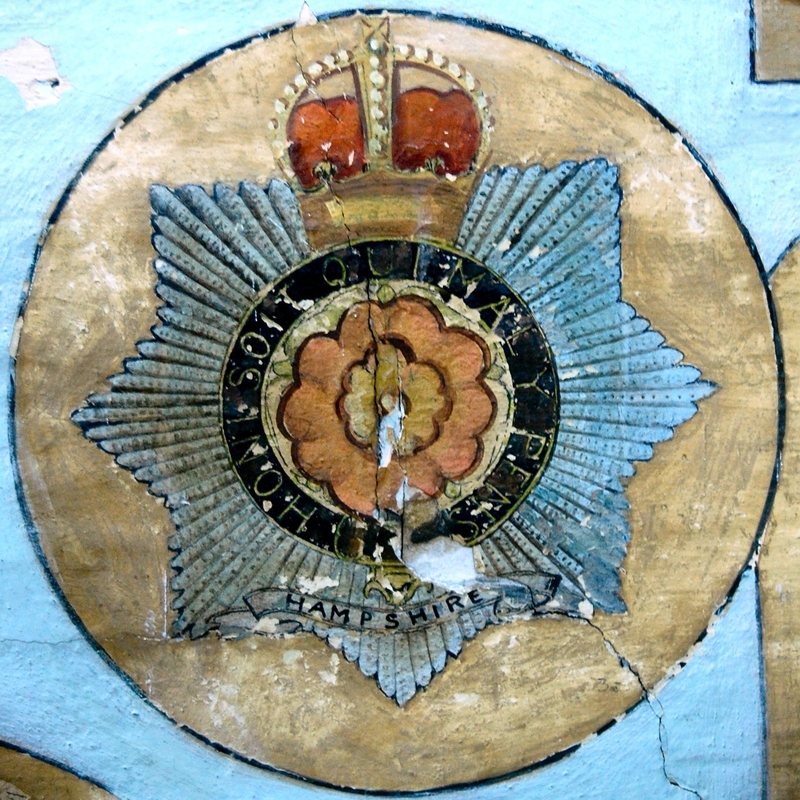 The 67th became the 2nd Battalion, The Hampshire Regiment. It distinguished itself in the China War of 1860 when it won no less than four Victoria Crosses. On 1 February 1827, the 67th was granted permission to bear on its Colours the Royal Tiger with the word India superscribed, to commemorate its service in India between 1805 and 1826. The rose beneath the Royal Tiger is a double rose known as the Hampshire Rose. This was the red rose of Henry V which was conferred to the City of Winchester in 1415. The Hampshires became a Royal Regiment in 1946, and the prefix Royal appeared on the badge from April 1949. In September 1992, the regiment amalgamated with the Queen's Regiment to form the Princess of Wales's Royal Regiment (Queen's and Royal Hampshires). 23 July The 1st/Hampshire Regiment embarked at Portsmouth from Gosport Barracks, and arrived in Malta on 2 August. The regiment had an average strength of 412 men. It had 660 admissions into hospital with 6 deaths. 3 invalids returned to England. Its average constantly sick was 29.64. The average sick time to each soldier was 26.33 days. The average duration of cases of sickness was 16.43 days. The PMO, Surgeon-General James Sinclair, remarked that the 1st/Hampshire Regiment had a large number of admissions into hospital. The battalion arrived in August, when fevers prevailed in the island. A soldier was admitted into hospital with multiple injuries following a fall into the fosse at Porta Reale. The 1st/Hampshire Regiment had an average strength of 975 men. It had 719 admissions into hospital with 9 deaths. 20 invalids returned to England. Its average constantly sick was 39.45. The average sick time to each soldier was 14.76 days. The average duration of cases of sickness was 20.32 days. 9 Jan The 1st Battalion embarked for Bombay India where it arrived on 27 Jan 1886. 8 Apr Baptism of Alice Sophia Perotti daughter of Annie and Sgt John William Perotti of the Camarata Valletta, born on 11 Mar 1886. 21 Feb 1941 The Hampshire Regiment returned to Malta in 1941. It formed part of 1st Malta Bde (later 231 Infantry Brigade) of the 50th Northumbrian Division, with the 2nd/Devonshire Regiment, and the 1st/Dorsetshire Regiment. 30 Sep Strength 32 officers and 933 men. 3 Apr 1942 The battalion moved to Alexandria with 231 Infantry Bde in preparation for the invasion of Sicily (Op Husky). 5498447 Pte James Joseph Smith died on 8 May 1942 aged 24 yrs. 17 July 1942 Lt W. A. Mayne RAMC 39th General Hospital was attached to 1st/Hampshire regiment as its medical officer. On 17 July Mayne was posted from 15th Field Ambulance to 1st/Hampshire. 1 Mar 1943 118091 Capt I Joseph RAMC 15th Field Ambulance was attached as the RMO to 1st/Hampshire Regiment. 30 Mar 1943 The battalion embarked for Sicily (Op Husky) as part of 231 Infantry Brigade. For its role in Malta during the war, the Hampshire Regiment was granted the Battle Honour Malta 1941-42. 8 Sep 1903 The 2nd Battalion embarked at Southampton from Portsmouth on the Soudan. It arrived in Malta on 16 Sep 1903. 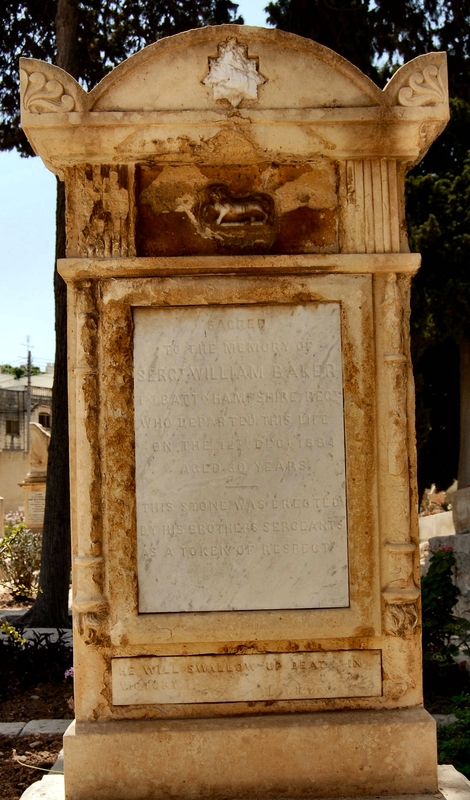 The regiment was quartered at Verdala Barracks Cottonera for the duration of their posting to Malta. 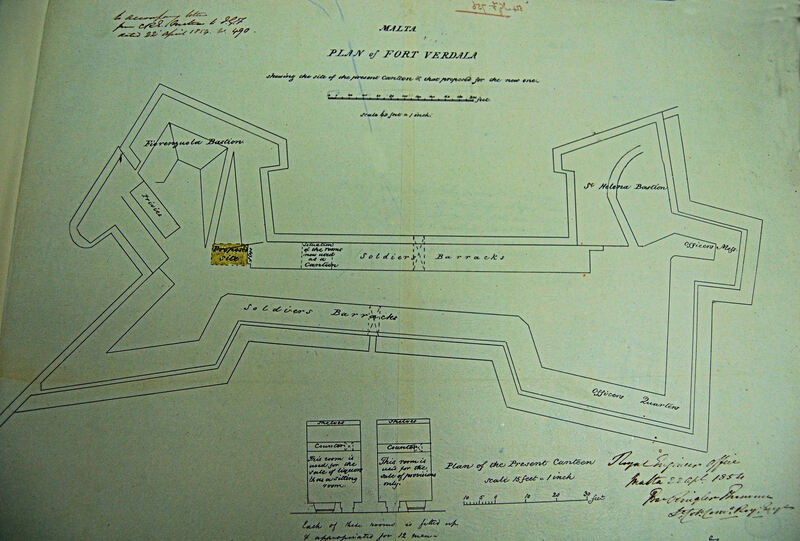 A portion of the battalion occupied some of the smaller barracks in Cottonera Lines such as the Polverista and St Clement's Barracks. 7 Nov Burial at Rinella Military Cemetery of Eillen Lilian Giddens aged 3 months, who died at Verdala. 1904 The regiment was located at Verdala Barracks Cottonera. 22 June LCpl George Miles aged 22 years 1 month, died at Cottonera Hospital. 17 July Henry George John William Davies aged 12 weeks, son of QM Sgt Davies died at St Nicholas Married Quarters. 21 July Ada Marion Kempton aged 1 years 7 months, daughter of Sgt J Kempton died at St Nicholas Married Quarters. 17 Sep Pte William Durrant aged 24 years 8 months, died at Verdala Barracks. 1905 The battalion occupied Verdala Barracks Cottonera with detachments at Polverista, St Clements and Zabbar Gate Barracks. Verdala Barracks consisted of 66 small casemate rooms, each accommodating 10 men. The rooms were arranged on two floors and in two rows. The rooms in Polverista were arched casemates each accommodating 14 men. 29 June Burial at Rinella Military Cemetery of Pte Thomas Henry Baker 2nd/Hampshire aged 29 years 4 months of Verdala Barracks. 2 Dec 1905 The 2nd Battalion embarked for Bermuda on the Soudan. 28 Feb Paul Ralph Emerson Jenkins born on 22 February 1917, twin son of Capt Ralph Emerson Jenkins 1st/7th Hampshire Regt and Nancy resident at Fovy Dene Cecil Avenue Bournemouth. 28 Feb Michael Thomas Emerson Jenkins born on 22 February 1917, twin son of Capt Ralph Emerson Jenkins 1st/7th Hampshire Regt and Nancy resident at Fovy Dene Cecil Avenue Bournemouth. TNA:WO 156/597. Baptism Register Garrison Church Malta 1886 to 1898. TNA:WO 156/599. Register of baptisms in the Barracca Church Valletta from 18 August 1916 to 6 November 1949.